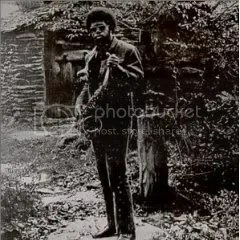 I’ve heard the terms “free-jazz” and “fire music” before, but these were merely words used to describe noisy jazz records I liked until purchasing a reissue of Joe McPhee’s Nation Time. This sounds like yet another slice of hyperbole littering this website, but this music awoke something inside me each time it played. It stood apart from Ornette, John and Alice Coltrane, Archie Shepp and others whose improvisations altered my musical worldview. These guys and gals showed me that enjoyment can be found in chaos, but none of them married it to such relentlessly funky and aggressive rhythms. This music was free and fierce, but strangely accessible and endlessly listenable. I started searching for something similar, but haven’t found it yet, but Luther Jackson’s Funky Donkey came damn close. Nation Time is drawn from a 1970 live set and consists of three compositions. I always found the title track to be the centerpiece of this set. It’s strength lies in how McPhee and his band straddle melody and mayhem. However, recent listens have led me to realize that it’s follow-up “Shakey Jake” is just as mind blowing with its synthesis of free-jazz, James Brown and Funkadelic. Everyone is blowing and beating their hearts out simultaneously Chaos gives way to collaboration and it transforms into something special that was only attempted by Ronald Shannon Jackson during the 80s. However, It’s the only time that I’ve heard McPhee explore this facet of his music. I love most phases of McPhee’s career, but Nation Time and 1971’s Trinity hit heights unmatched by any jazz artist of those two years.